In 2012, Michelle Obama pushed for the enactment of new rules and regulations governing lunches and snacks served to students in public schools. The program soon became known as the Michelle O lunch program. 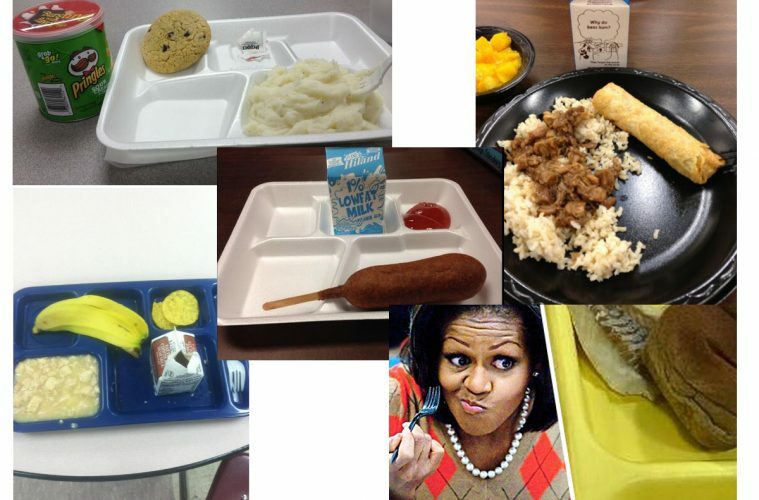 There have been numerous reports on the horrors associated with the Michelle O lunch program. Some reports have revealed that students were served moldy food as in the case of a boy attending a Head Start school in Georgia. His mom wanted to know why her son wasn’t eating his lunches and he told her it was bad. When she investigated the matter, she discovered that her son was given lunches with old coleslaw and moldy French fries. The mom took photos and said that lunches were more suitable for the garbage can than for the kids. In another instance, students in North Carolina were being served red and pink burgers as part of their Michelle O lunches. When parents complained, the school informed them that the burgers were fully cooked in a steamer per new Michelle O lunch rules. Supposedly, the steamer left parts of the meat patties pink and red even though they were supposed to be fully cooked. Many students still refused to eat the raw looking meat. Many reports surfaced of students throwing most or all of their school lunch into the garbage can instead of eating them. When a student in northern California wasn’t hungry and offered to share the chicken burrito from his Michelle O lunch with another student, he was given detention. The student felt that it was better to share his food with another student instead of throwing it in the garbage can, but Michelle O’s lunch rules forbid the sharing of food, so the well-intentioned student was punished for his goodwill gesture.